October 3, 2014 | Dental Implants. Almost natural. Dental implants are strong and stable. To a person, the implant will look, feel, and function like any other tooth. Having this placeholder also prevents other problems such as bone deterioration or difficulty eating. Last longer than dental bridges. While dental implants may need adjustments from time to time, they can last a lifetime. It’s your smile. Without teeth, your face can appear sunken or sad and many people feel self-conscious about smiling with missing teeth. A dental implant allows you to keep your natural facial structure and smile. You won’t have to keep your teeth in a cup. You won’t have to worry about dentures slipping, falling out, or cleaning them in a cup. With an implant, you care for it like you would your normal teeth without having to change your routine. No speech problems. Dentures can make it difficult to pronounce a lot of words, especially when adjusting to them but that’s not the case with dental implants. No cavities. Your implant can’t have a cavity. This doesn’t mean you shouldn’t see your dentist or brush your teeth as you still need to care for your gums and mouth. Preserve natural tooth tissue. With a tooth supported bridge, part of a healthy tooth is ground away to support the bridge. 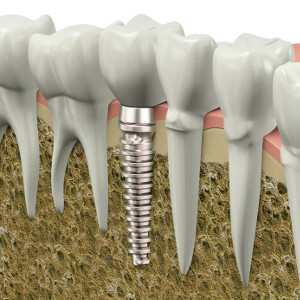 Dental implants go into place where your missing tooth root was, so they don’t impact healthy teeth. Easier eating. With dentures, your teeth can slide making it difficult, and sometimes painful to eat, but with dental implants, everything is where you are used to it, making eating easier.